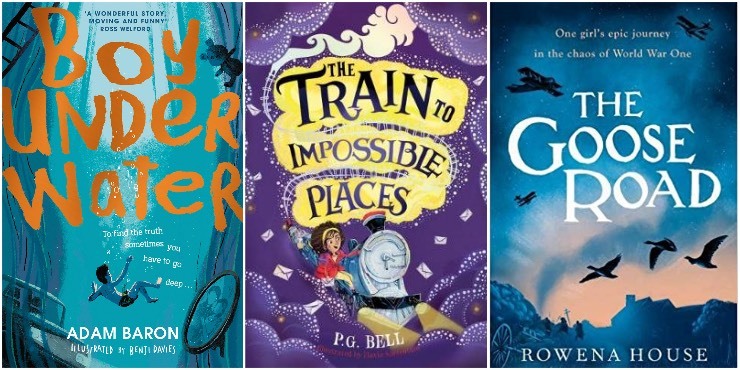 The Branford Boase prize recognises the authors and editors of the year’s best debut novels for children. Previous winners and nominees have gone on to do great things, so why not try a new author today? “Violet’s in her element - cosplay at the ready, she can’t wait to feel part of her favourite fandom: The Gallow’s Dance, a mega-story and movie franchise. But at Comic Con, a freak accident transports Violet and her friends into the The Gallows Dance for real - and in the first five minutes, they’ve caused the death of the heroine. “Danny’s mam has a new boyfriend. Initially, all is good - Callum seems nice enough, and Danny can’t deny he’s got a cool set up; big house, fast car, massive TV, and Mam seems to really like him. But cracks begin to show, and they’re not the sort that can be easily repaired. As Danny witnesses Mam suffer and Callum spiral out of control he goes in search of his dad. The Dad he’s never met. “Eleven-year-old Tilly has lived above her grandparents’ bookshop ever since her mother disappeared shortly after she was born. Like the rest of her family, Tilly loves nothing more than to escape into the pages of her favourite stories. “15-year-old Muzna Saleem is passionate about writing and dreams of becoming a novelist. There’s just one problem - her super-controlling parents have already planned her life out for her: Step 1: Get educated. Step 2: Qualify as a doctor. Step 3: Marry a cousin from Pakistan. Oh, and boyfriends are totally haram. “There used to be an empty chair at the back of my class, but now a new boy called Ahmet is sitting in it. He’s eight years old (just like me), but he’s very strange. He never talks and never smiles and doesn’t like sweets - not even lemon sherbets, which are my favourite! “No one can get into Scotland, just like no one can cross the channel. England is under control of an authoritarian regime. They can track anyone, anywhere from a chip implanted in their skin. “Lily wakes up one crisp Sunday morning on the side of the road. She has no idea how she got there. It is all very peaceful, and very beautiful. It is only when the police car, and then the ambulance arrive, and she sees her own body, that she realises that she is in fact dead. “Taran and her twin Hari never wanted to move to Firestone House. But when the rent was doubled overnight and Dad’s chemo meant he couldn’t work, they had to make this tower block their home. It’s good now though; they feel part of something here. “Reema runs to remember the life she left behind in Syria. Caylin runs to find what she’s lost. Under the grey Glasgow skies, 12-year-old refugee Reema is struggling to find her place in a new country, with a new language and without her brother. But she isn’t the only one feeling lost. Her Glaswegian neighbour Caylin is lonely and lashing out.